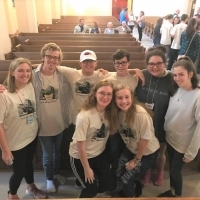 Recently both adults and youth from St. Margaret's and around the Diocese made the decision to attend weekends to deepen their faith among a community. On November 2-4 Journey #3, a weekend sponsored by Arkansas Episcopal Cursillo, was held at Camp Mitchell on Petit Jean Mountain. Both Rev. Stephanie Fox and Leah Dalton served on the leadership team for the retreat. Eve Berry was one of our participants for the weekend, which is a short course in living the Christian life in community. Over 2,000 Episcopalians have participated in the Cursillo/Journey movement in Arkansas. It is a powerful course designed to strengthen your Christian walk and give tools to continue to live out the life Christ is calling you to. My Cursillo weekend was instrumental in my faith journey. It helped me connect with other people of faith in my local community, which forms my Reunion Group. 8 years later, this Reunion Group continues to be a source of support and accountability for my walk with Christ. I was excited and honored to serve as Clergy and Spiritual Director for Journey #3, which is open to newcomers, as well as those who have attended a Cursillo or Road to Emmaus wekeend, and wish to renew their faith. On November 16-18 six high school students from St. Margaret's attended Happening #40 at Christ Church in Little Rock. This weekend was led in part by Olivia Alexander and Bennett Tinnerman, high school students from St. Margaret's.. Happening is a special weekend that helps teens deepen their faith. We are excited to see how God is moving and working in the lives of our St. Margaret's family.